Having a Great Week with Genevieve Jacobs, M.D. Seeing all kinds of cool orthopaedic stuff! 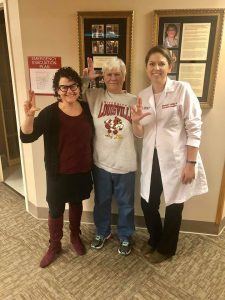 Today we have the privilege of treating one of our University of Louisville Women’s basketball team season ticket holders. She was giving us the scoop on the U of L vs U Conn win. So proud of our lady Cards!! !